Claim: Instead of helping low-wage workers, an increase in the minimum wage will cause them to lose their jobs. Certainly that's the prediction from the classical model of the labor market. Everyone's being paid precisely their marginal product (their value added to their firm's production at the margin) and to increase their pay by mandate is to render them unaffordable. In fact, the prediction from the simple model is that even a few pennies increase in the minimum wage would lead to extensive job losses. And yet... we've had dozens of federal minimum wage increases and now have 19 states with minimums above the Federal level. Surely if the classical model were correct, we'd have clearly seen its negative impacts by now. Which makes it, like all good economic questions, an empirical one. Thankfully, there's been extensive research on the question which is very usefully reviewed here by economist John Schmitt of CEPR. Pay particular attention to the results from all those natural experiments created by all the variation among the states. I've often said the true elasticity of job loss with respect to a minimum wage increase hovers about zero. I've seen good studies finding small negatives and good ones finding small positives. John presents this very cool graph from a "meta-analysis" -- a study of a bunch of studies -- showing precisely that result. There are outliers on both sides of zero, but the strong clumping around zero provides a useful summary of decades of research on this question. These results don't mean that no worker ever loses her job when the minimum wage goes up. But they do mean that the vast majority get a raise and that anyone blithely citing the classical model, as Boehner did the other day ("When you raise the price of employment, guess what happens? You get less of it"), is speaking from prejudice, not from the evidence. Claim: We don't need the minimum wage, we've got the EITC. Proposals to increase the minimum wage invariably lead its opponents to profess their love for the Earned Income Tax Credit, a wage subsidy for low-wage workers in low-income households. That's great -- the EITC is an excellent program, lifting millions of low-income workers and their families out of poverty. And because eligibility is a function of income, it is extremely well targeted. But two things to watch out for. 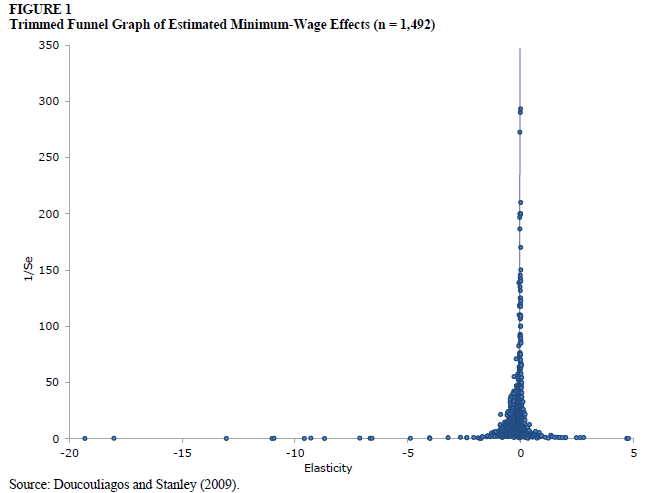 First, it's a non-sequitur to compare a minimum wage increase to the fact that the EITC exists. Those who want to tout their preference for the EITC to lift the pay of low earners must explicitly call for an increase. In doing so, they are calling for more redistribution from taxpayers to low-income workers. I'm fine with that, but is the oped page of the WSJ? Second, we need both policies: They're complements, not substitutes. As income inequality continues to divert wage growth away from low- and middle-wage workers, those who solely depend on the redistribution through the tax and transfer code are implicitly calling for Congress to ratchet up these measures year after year. That's not going to happen, so every few years we need to raise the wage floor so as to be certain that low-wage workers get a slightly larger share of the pre-tax growth they're helping to create (and if we index the wage floor, as the president proposes, we won't have to keep revisiting it). Claim: If the minimum wage is so great, why not make it $90 an hour instead of $9? "If raising the minimum wage is good economic policy, why stop at $9 per hour? Why not increase it to $90 per hour? By the President's logic, doing so would dramatically increase the income of not just millions of working families, but tens of millions of working families, and indeed of almost all working Americans." This just betrays a lack of knowledge of the wealth of literature reviewed by Schmitt, including the important insight, shown in Schmitt's table 1, about the share of workers picked up in the "sweep," i.e., the area between the current and the proposed new minimum wage. Historically, as shown in the figure below, increases have affected less than 10 percent of the workforce. As Keith points out, a $90 minimum would affect about 100 percent. There's a difference. Keith is stuck in the classical model noted above where any increase violates marginal product theory. In the real world, there is a range wherein businesses can absorb the increase through various channels other than employment, including prices, profits, and productivity. No one knows that precise range, though in deference to Keith, I agree that it's less than 100 percent. 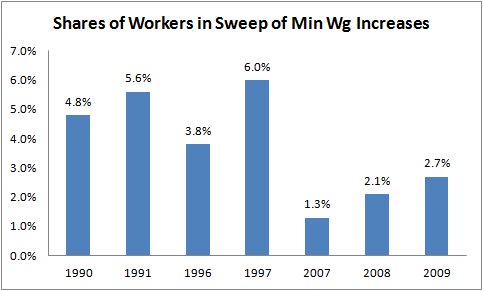 History shows, as in the first figure above, that increases carrying less than 10 percent of the workforce along in the sweep do not generate significant dis-employment effects. Claim: The increase doesn't reach the folks who really need it. Since eligibility for the minimum wage isn't conditioned on income, critics complain it that while it reaches low-wage workers, it doesn't reach low-wage workers in low-income families. Instead, the critics maintain, it goes mostly to part-time kids. Nope. Most -- certainly not all -- low-wage workers do in fact reside in low-income households and the demographics of those in the sweep belie the part-time-kids claim. -- 84 percent of total affected workers are at least 20 years old. -- 73 percent of the benefits of the increase go to those in the bottom half of the workforce by income level. -- 47 percent of affected workers are full-timers, 83 percent work at least 20 hours per week. -- The average worker in the sweep brought home 46 percent of her household's earnings in 2011 (from the White House fact sheet). So while we'll all the old arguments and counter arguments are being trotted out once again, I urge folks to remember: Analysis of the historical record shows that increasing the minimum wage has its intended effect of raising the earnings of low-wage workers who need the raise without harming their employment prospects. It won't transform the labor market or rebuild the middle class, but it is a vital if small part of the connective tissue that used to bind even our lowest wage workers to the more broadly shared prosperity that has eluded them for decades. *Note that EPI includes workers directly and indirectly affected by the increase, since research has found that those earnings within a dollar of the new minimum also tend to get a wage boost. However, the reported shares are little affected if I look solely at directly affected workers.